Alpha Chi Sigma Fraternity was organized at the University of Wisconsin at Madison in late 1902 by a group of undergraduates who were fellow students in chemistry at that time. Later documents set the date of founding as December 11, 1902. The story of the founding of the Fraternity probably is told best by those who were there. In a 1913 article called Reminiscences (appearing in The HEXAGON of Alpha Chi Sigma), founders Mathews and Kundert describe those first days of the Fraternity. To read the Reminiscences click below! 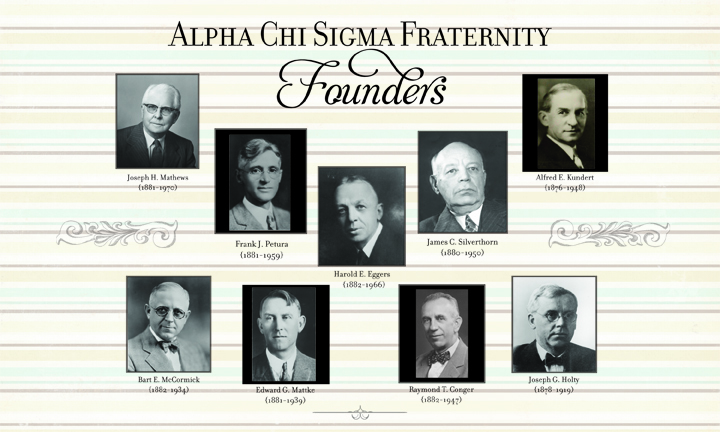 Alpha Chi Sigma Fraternity has had many important moments in our over 100 years. From the foundation of the Fraternity to expanding across the United States to the various prestigious awards established, ΑΧΣ is proud to remember all of the events that have led us to where we are now.